Companion made this beautiful salad. My first instinct, of course, was to take a picture. But it tastes good too. The white chunks are not cheese, though they sort of look like it from this angle. They are kohlrabi, a close relative of broccoli eaten for the stem, rather than the florets. Kohlrabi has a nice, nutty taste and crispy texture. Cucumbers have a different sort of cool crunch that complements it wonderfully. the tang of cherry tomatoes and the earthiness of dark green lettuce balance the whole thing out. 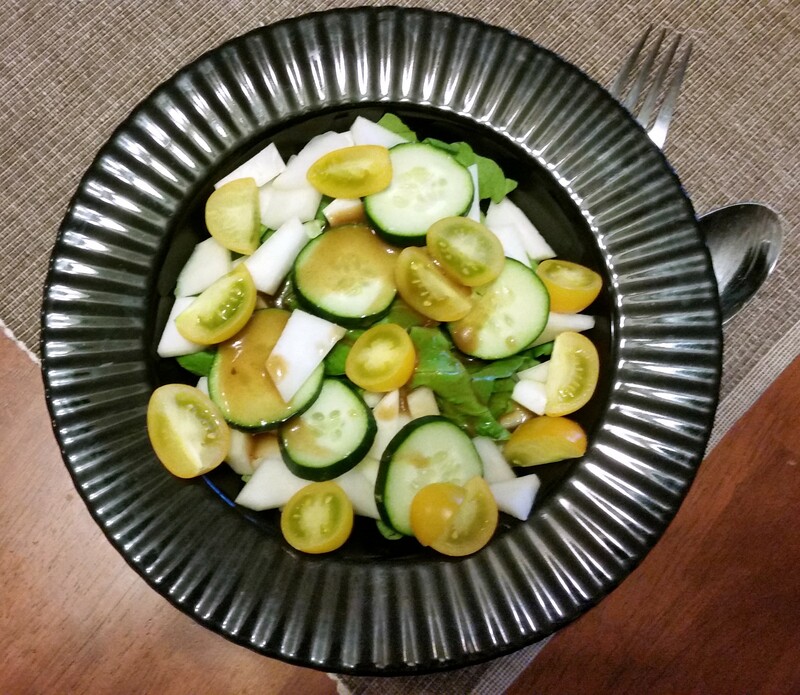 The salad goes wonderfully with a simple balsamic vinaigrette. Makes 1 large or 2 small salads. Lay some clean lettuce leaves at the bottom of each bowl. Top with remaining vegetables. In a jar or glass bottle, mix oil, vinegar, salt and pepper. Put lid on container and shake vigorously. Drizzle dressing over vegetables and serve.